First of all, sorry for the infrequent blog updates. I’m still waiting for Internet in my apartment. Fortunately, I can bring my laptop to one of my schools and use the wifi here. My roommate from Tokyo Orientation was able to get his wifi set up already, and he is running a blog where he posts one photo everyday. Check it out here. Also, after three weeks since arriving in Awaji, two trips to the cell phone store, and a two-hour activation wait, I finally have an iPhone! Don’t worry. There will be a later post to document that experience. As someone who has only ever had a basic phone, this has been a life-changing week for me. The “Awaji-shima Matsuri” (festival) was going on my first weekend on the island. My predecessor was still in town so she drove me down south to the biggest city on the island, Sumoto. There, we met a retired Japanese businessman named, Uemiyasan. He used to teach a former JET Japanese, and I think I’m his new protégé. After meeting him, he immediately invited me to dance in the festival. Before I knew it, I was suited up in a yukata and dancing in front of all of Sumoto. This was only my third day on Awaji, and already I was included in the community. With the continuous drumming and synchronized shouting ringing in my ears, I managed to stay on tempo has we made our way through a shopping center and down main street. The entire community lined the sidewalks and snapped photos of all the festivities. To get a feel for the atmosphere, here is a video that another JET posted. Once the parade was over, we changed out of the sweat soaked yukatas and all joined together for dinner which was laid out for us on tarp covering the side of the street. Bento boxes were on the menu that night, and whenever my cup of barley tea reached half empty, there was always a sweet old Japanese lady ready to fill it back up for me. In this culture, you never pour drinks for yourself! 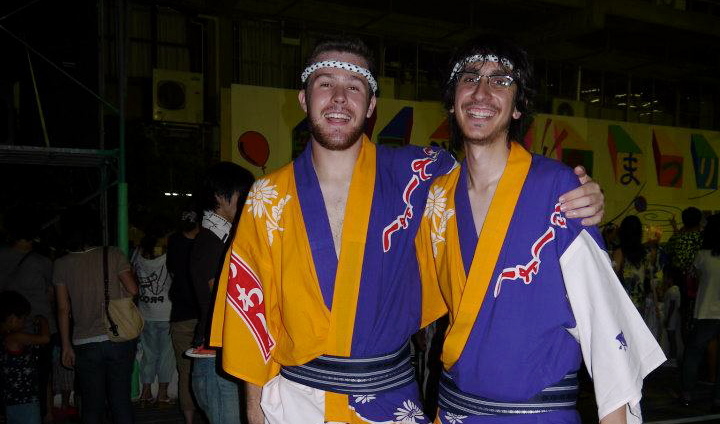 John and me in our yukatas after dancing in the festival. As we ate, various members of the community-center group that we danced with gave brief speeches. While the speeches were going on, I enjoyed my dinner while readjusting my crossed legged sitting position. I soon discovered there is no comfortable way to eat dinner while sitting on the street. But I was able to stretch my legs as I was unexpectedly thrown a microphone and told to give a self-introduction in Japanese. This marked the first time that I publically used my self-introduction speech that I spent a Saturday back in July on memorizing. In Japanese I said, “Hello, nice to meet you. My name is Stephen. I am twenty-two years old. I am from Boston. I like baseball. Nice to meet you, and thank you for your hospitality.” At least, I hope that’s what everyone got out of my mumbling. It’s interesting to note that the Japanese always want to know your age. I was told to include my age in my self-introduction, and those Japanese language teachers’ back in Boston weren’t lying. As soon as I said that I was twenty-two, everyone gasped and mumbled for a few seconds. Maybe the beard made me look older? Anyways, the speech was a success and after, the host rambled on in Japanese. I sat there not understanding any of it. But hey, I was a guest at a Japanese festival, so I wasn’t really bothered with not knowing what was going on. This entry was posted in Culture, Life on Awaji and tagged Awaji, dance, festival, Japanese festival, Matsuri, Sumoto, yukata. Bookmark the permalink. Jon, I can totally see you dancing in Japanese festivals. Sounds like a lot of fun! Festivals are awesome, right?? iPhones are key in Japan! Thanks Brad. Japan’s not the same without you here! This blog is about my adventures on the JET Program in Japan. Hey, I'm Stephen! Feel free to reach out to me with blog ideas, comments, or questions. Thanks! Did you really visit camp if you didn’t post a sunset photo?